Books, books, books, reading, writing, discussing, books, books, books. Are you getting tired of book talk yet? [wink] I promise I’ll have more picture and adventure posts as our “school-year” commitments wind down at the end of April and the sun [please, oh please!!] begins to shine. If you have read here at Mt. Hope Chronicles for longer than, say, a day, you know I adore book lists. I eat, sleep, drink, and breathe books lists. I have my own book list challenge for 2015, and I’ve crossed a few more off the list in the past couple weeks. I notice a big difference in my reading habits when I have a book list. I don’t want to read just to cross off a book on a list, but I will admit it is a motivator. This past week, a few things came up that made me want to make up a book list challenge for my boys. I’ve been running out of ideas for them, so they’ve been picking up books randomly. That isn’t a bad thing, but they could be reading better selections, and they are willing to do so if I hand them one. 1. I finished reading Honey for a Teen's Heart, and I adore it. I must review it this week. 2. I read this article about the differences in school reading lists for 8th graders in the year 1908 and today. 3. An online conversation reminded me of The New First Dictionary of Cultural Literacy: What Your Child Needs to Know by Hirsch. I got out my copy and started reading it again, beginning with the literature section (of course). It doesn’t take much to inspire me to make a book list, and this put me over the edge. Must. Make. List. I don’t want to use this collection as a law or as some standard of achievement. It is simply this—here are some wonderful works of literary art in which children should have a chance to immerse themselves. Books with rich language and imagery, diverse time periods and geographical locations, interesting characters. Books that have withstood the test of time. Books that are oft-referenced in other literary works. Books and stories and characters that are found in parts and pieces throughout our culture. 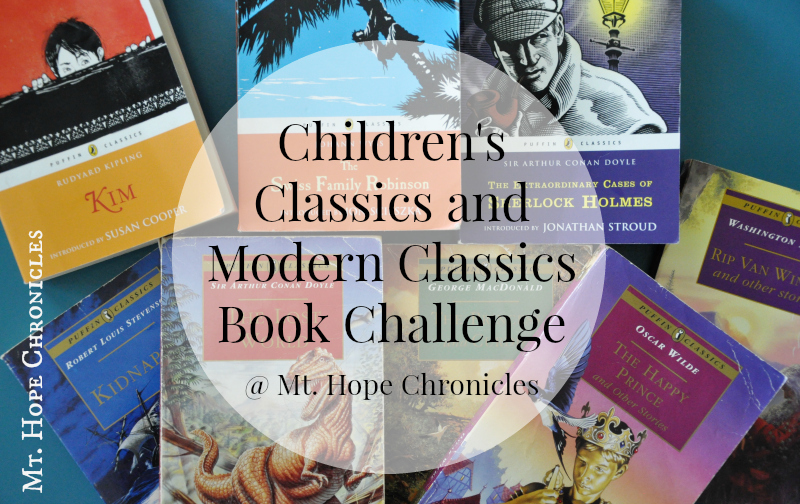 As I perused the list of Puffin Classics and Modern Classics, I thought that I’d love to have my boys enjoy as many of these as possible by the end of their 6th grade year, before entering the Classical Conversations Challenge program in 7th grade. Levi has already read most of them, and he’ll make short work (or play, as the case may be) of the few he has left. I think Luke could read most of them by the end of the summer. I’ll save the ancient history related books for this coming school year when we head back to ancient history and literature. My plan is that we will all read at least a couple together and use the Book Detectives model to discuss the stories and think about them more deeply. I chose our next few read-alouds. I then made a list of Puffin Classics in addition to those listed above and marked whether Luke or Levi had read them. Which classics would you add to the above list for children under 12 or 13? I am having them wait on Red Badge of Courage (which they will read in Challenge I along with The Call of the Wild and Tom Sawyer) and abridged books (Dickens, Dumas, Bronte). They have read several abridged books and retellings so I’m not against them entirely, but I would rather they spent their time reading the other books on the list. We are currently reading A Tale of Two Cities (unabridged) by Dickens together (which they will read again in Challenge II along with Jane Eyre, Pride and Prejudice, Alice’s Adventures in Wonderland, and many others). The boys also have or will read retellings of classics (some of which they will read again in Challenge II) such as Beowulf, Canterbury Tales, Don Quixote, Gulliver’s Travels, Robinson Crusoe, and Pilgrim’s Progress. Levi has read Anne of Green Gables, but I’ll probably just have all the boys watch the movies with me this summer. Everyone should watch the movies, even if they don’t read the books. Then we have the Puffin Modern Classics, many of which my boys have already read. I have so many more books I would add to the modern children’s classics list! But attempting my own must-read modern children’s classics list at the moment would be like falling down a rabbit hole. Enough list-making. Let’s go read! Hey, friends! Have you had a chance to listen to the Read-Aloud Revival Podcast with Sarah Mackenzie of Amongst Lovely Things? 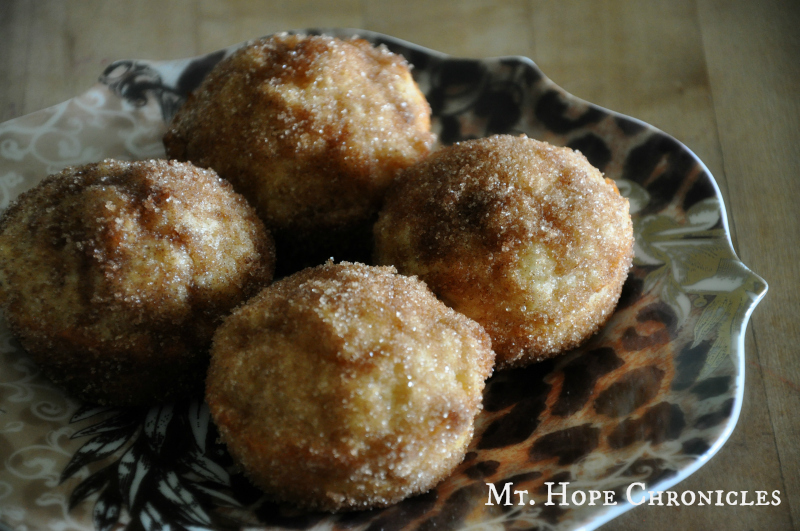 If you haven’t, you are missing out! In the podcast, Sarah, author of Teaching from Rest, chats with a wide range of guests about creating a family culture around books and reading aloud. You can listen to talks with Andrew Pudewa, Tsh Oxenreider, Jim Weiss, [cough] me [cough], and many others. This week, Sarah is launching the Read-Aloud Membership Site with benefits such as podcast transcripts, cheat sheets, worksheet pages, live author events, video workshops, and more! If you join the Read-Aloud Membership Site, you will be able to watch me talk for over an hour (broken down into six shorter videos) about creating a parent and child book club! Really, can one spend too much time talking about books? I don’t think so. Go check it out! I have been sharing about Aristotle’s 5 Common Topics of Invention this year. [When you see the word Invention, it might help to think about gathering an inventory of ideas, which is what we are doing when we ask questions!] I’ve given examples of what it might look like if one is using the common topics to discuss a classic piece of literature (albeit children’s literature) or even a picture book (which can also be literature, and certainly was in the example). But, you might be saying, I haven’t read those books! It is hard to participate in a discussion about a book if one hasn’t read it! What if I told you that you could use the common topics to have a deep discussion about a single sentence? Yes, you can. Some of you attended a Classical Conversations Parent Practicum last summer and had the chance to break into small groups to do just that. When I spoke, I used the above quote for our small group discussion material. The definition alone, as usual, could have taken up all of our discussion time. In fact, one can have a deep discussion about a single word using only the topic of definition. I will ask a few questions using the five common topics. You are welcome to use them to contemplate the idea of leisure, to discuss the quote with family or friends, or to share thoughts in the comments here. What broad category does leisure belong to? What are other things/divisions under that category? How is leisure the same as or different from the other things within the broad category? Compare leisure and labor. Similarities? Differences? Leisure and relaxation? Leisure and laziness or idleness? Leisure and pleasure? Compare leisure and a river. How is leisure related to art? How is leisure related to culture? How is leisure related to slavery? How is leisure related to the Sabbath? Is leisure a luxury or a necessity? What is necessary in order to have leisure? How does one acquire leisure? What effect does leisure have on a person? On a society? Who, historically, has had leisure? What kind of people? In which cultures? How has the definition of leisure changed over time and in different cultures? What is leisure and who has it in cultures with a caste system, slavery, or communism? 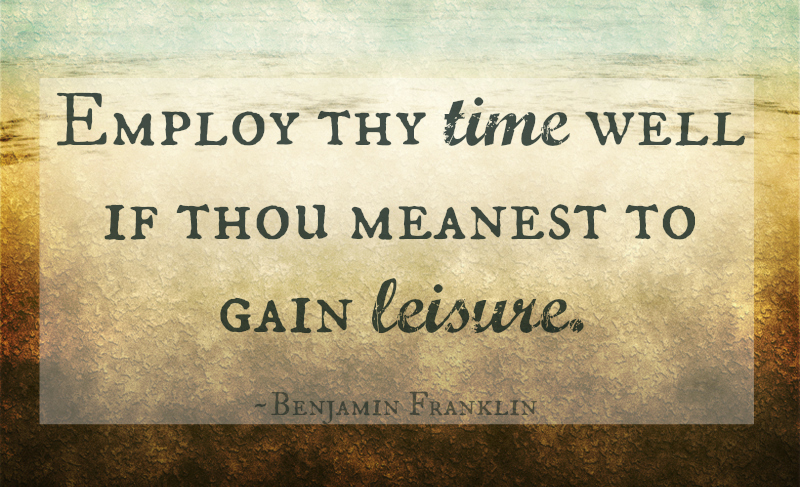 What was leisure in Ben Franklin’s world? Who or what has something to say about leisure? Are they an authority, a witness, or are they giving their testimonial? Are there maxims about leisure? Laws? Statistics? Is Ben Franklin an authority? What would your grandfather have said about leisure? A celebrity? Which of these “authorities” are credible? Why or why not? Did you know that thinking about the five common topics is practicing leisure? The following are quotes, books, and articles about leisure that may be used to expand the conversation. Employ thy time well if thou meanest to gain leisure; and, since thou art not sure of a minute, throw not away an hour. Leisure is time for doing something useful; this leisure the diligent man will obtain, but the lazy man never; so that…[a] life of leisure and a life of laziness are two things. Instead, Pieper maintains that the arts are most definitely rooted in leisure. Pieper insists that we have forgotten the true meaning of leisure, from which springs richness, fullness of life, existential meaning, and happiness. Leisure is not idleness or even relaxation (both of which Pieper ironically says are other forms of work). Instead, leisure is the openness to the given world, an attitude of considering the things before us in a celebratory spirit. 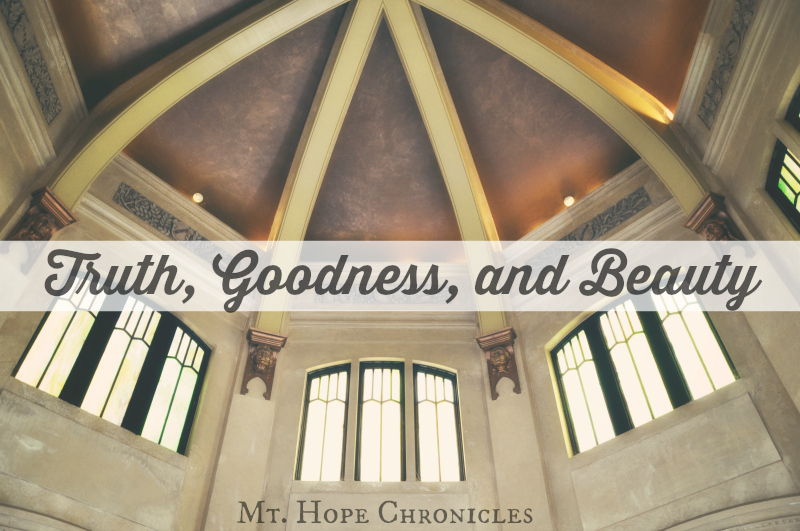 [p 34] St. Thomas speaks of contemplation and play in the same breath: “because of the leisure that goes with contemplation” the divine wisdom itself, Holy Scripture says, is “always at play, playing through the whole world.” (Prov 8:30f.). [p 46] For leisure is a receptive attitude of mind, a contemplative attitude, and it is not only the occasion but also the capacity for steeping oneself in the whole of creation. [p 53] Leisure…is not a Sunday afternoon idyll, but the preserve of freedom, of education and culture, and of that undiminished humanity which views the world as a whole. [p 65] The soul of leisure, it can be said, lies in “celebration.” Celebration is the point at which the three elements of leisure come to a focus: relaxation, effortlessness, and a superiority of “active leisure” to all functions. But if celebration is the core of leisure, then leisure can only be made possible and justifiable on the same basis as the celebration of a festival. That basis is divine worship. [p 69] The vacancy left by absence of worship is filled by mere killing of time and by boredom, which is directly related to inability to enjoy leisure; for one can only be bored if the spiritual power to be leisurely has been lost. Time for rest and recreational activities. Economic conditions in biblical times did not allow ordinary people much free time for leisure. However Scripture does give principles which apply to leisure. 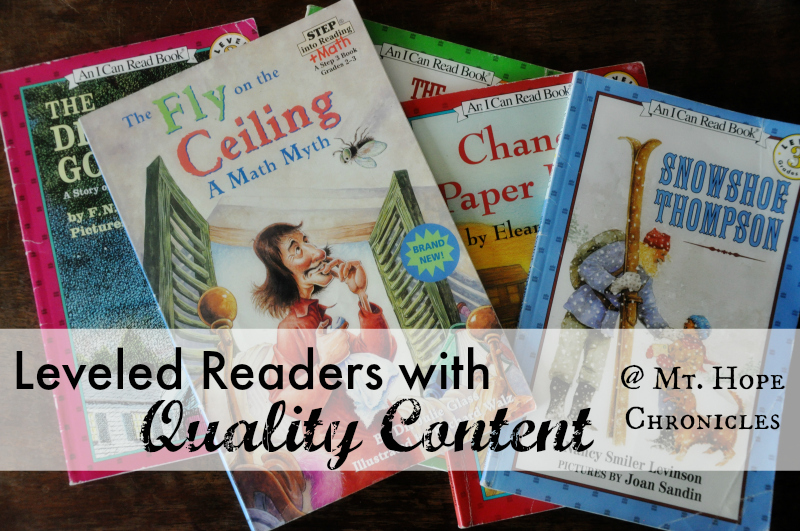 Has your child progressed past incremental phonics readers (such as my personal favorites by Nora Gaydos) but still needs controlled content to read aloud or independently? I adore rich picture books or excellent chapter books, but sometimes (often, if it is quality literature) the vocabulary in those books can be complex and intimidating for budding readers. This is where a need for leveled readers comes in to play. For some children, this is a very short stage before they take off with confidence and interest. For some children, this stage lasts quite some time. I appreciate leveled readers for the independence and confidence they can provide my children. They are wonderful for increasing speed and accuracy. I also appreciate that they are fairly inexpensive and fit neatly on a shelf together without taking up much space. I'm not saying all of these books are quality literature, and I wouldn't choose to read most of them aloud to my children (unless we're taking turns), just as I wouldn't read aloud Magic Tree House books. It's challenging to turn level 2 readers into quality literature (though Arnold Lobel is talented at it). But at least they introduce children to names, events, places, and ideas that may spark their interest. Or they may correspond with additional history studies. 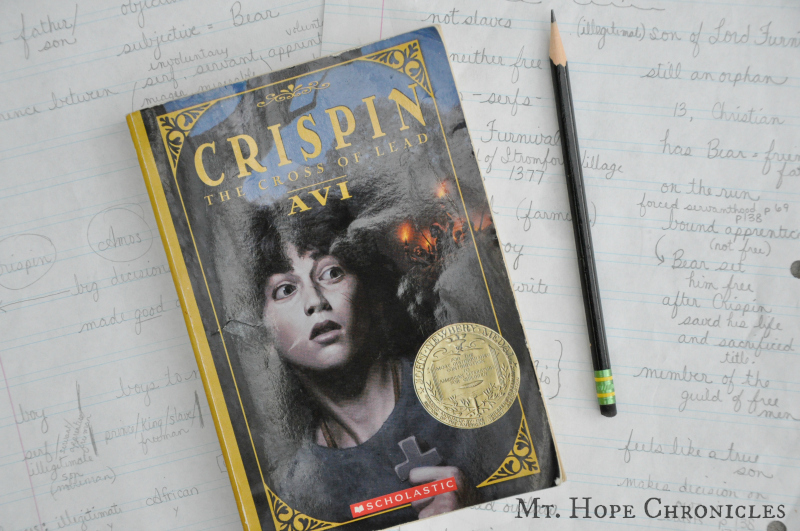 I am working on a fiction list, but for now I'll share the nonfiction and historical fiction titles to get you started. This is an extensive list, but it is not exhaustive. Not all reader levels are made equal (the DK readers may be more challenging), and some books have been republished as different series (particularly the All Aboard Reading to the Penguin Young Readers series) and their levels changed, so it was hard to keep them straight! My personal favorites on this list are the I Can Read Level 3 books. I’ve grouped the history-related books very generally. 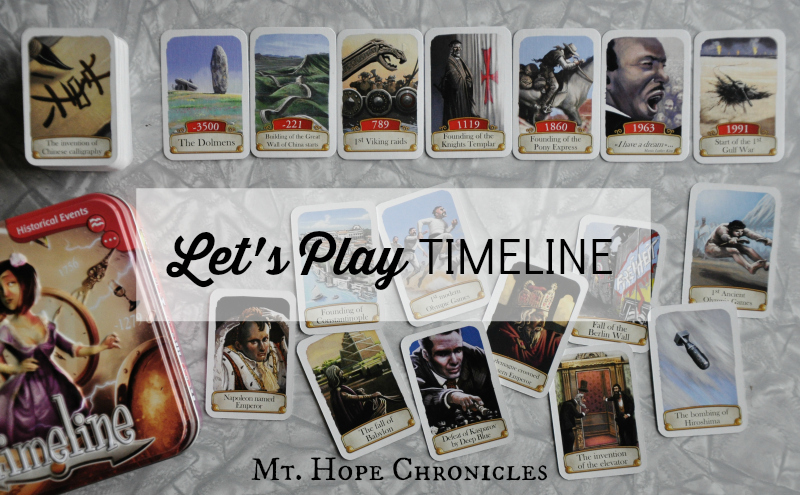 I have historical fiction and myths labeled under the history period to which they are related. I have biographies generally grouped according to time period or country. I tried to group like items within each level, but they are not listed chronologically. There are obviously far more American history-related readers than any other subject. [American] Mark Twain at Work! [American] Thomas Edison to the Rescue! I'll be posting a list of fiction titles soon!